*Please send me your phone number so we can keep in touch via message. 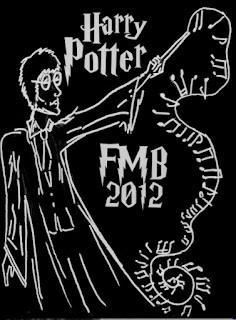 FMB parents, if you want your own FMB tshirts for yourself or your family, please email Mary Ellen Garwood no later than Friday, July 20 to place your order. Greetings and welcome to the 2012 Marching Band Season!! I am looking forward to another great season with all the bandos!! *Everyone should have a band polo for you official summer band uniform. If you do not and need one, I have a few still available. Please make sure your child’s shorts are not too short and mostly black. They should be easy to move around in. Thank you for a fantastic first two days of rehearsal, FMB members! We may be small this year, but we are capable of mighty things. Don't forget that we will be playing in the Horseshoe on October 13 capping off a great contest season! 1. Please be present and on time. Your presence and participation are of the utmost importance. 2. Come prepared for every rehearsal with your instrument, music, sunscreen, sunglasses, and water jug. 4. Stay hydrated. Drink water not just during rehersal, but throughout the day. The second question I will ask you is "have you been drinking water?" Encore is a local theatre which has been presenting summer musicals for the last 3 years. They've presented Guys and Dolls, Grease and Footloose. This year's production is Crazy for You. 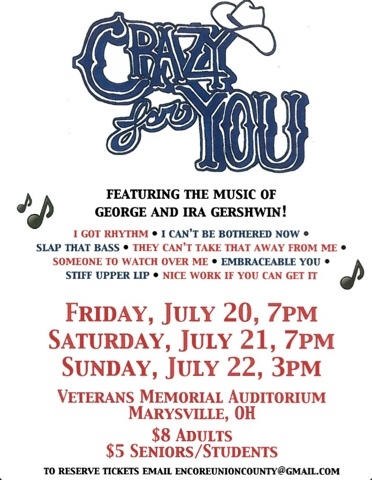 The play will be this weekend on Friday at 7, Saturday at 7 and Sunday at 3 in the Veterans Memorial Theatre in Marysville. I've attached information on the play and hope you'll take time to look at it and see the play. The group is comprised of teenagers from variuos high schools in the area and Fairbanks students have been represented in the past as well as this year. If you've gone in the past, you know how talented these young people are and how entertaining the plays have been. If you've not gone in the past, I hope you'll go to see this year's play and support these fine young artists. 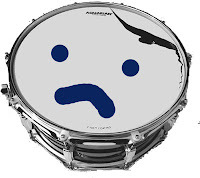 As we currently do not have a drumline instructor, drumline mini-camp will NOT take place on Monday, July 16, but is postponed until Wednesday, July 18, from 1-4 pm. As I may be serving as percussion instructor, I need additional time to prepare warmups, exercises, cadences, and contest repertoire. If you cannot attend this date and time, please notify me ASAP via email or text. My apologies for the late notice. Again, we are NOT meeting on Monday. Your final band camp payment is due no later than band camp check in on July 29. If you are able, please put your check or money order for your outstanding balance in the booster mailbox in the band room starting on Monday, July 16. The mailbox is secure and is emptied daily. Having your total $230 paid before band camp makes your check-in on July 29 that much smoother. Be sure to make all checks and money orders payable to "Fairbanks Music Boosters." A friendly reminder that to protect both you and the boosters, no cash is accepted. I don't share every post I make on there, but if you are on Facebook a lot, you might want to consider clicking the "like" button on our profile. Whether you're a member, a parent, or just a fan, it's one more great way to make sure you don't miss any information. Parental support is a necessity at band camp, so we're asking you to help out our fine Fairbanks musicians if you are able. We need a chaperones on duty during the day as well as overnight. Daytime duties mainly consist of filling, delivering, and dispersing water to our hot and tired band members, as well as being on stand-by in case we need supplies or medical help. Overnight chaperones are responsible for evening room checks and making sure members are in their rooms and quiet after lights out (ensuring that camp staff members can rest and be ready for the next day's rehearsal as well). Sign ups for these shifts will be at band camp check in, but if you know you want to take on a morning, afternoon, evening, or overnight shift, you can email Lisa V. any time and let her know what shift you want. This is a great way to help out and show our band members that you care about them. 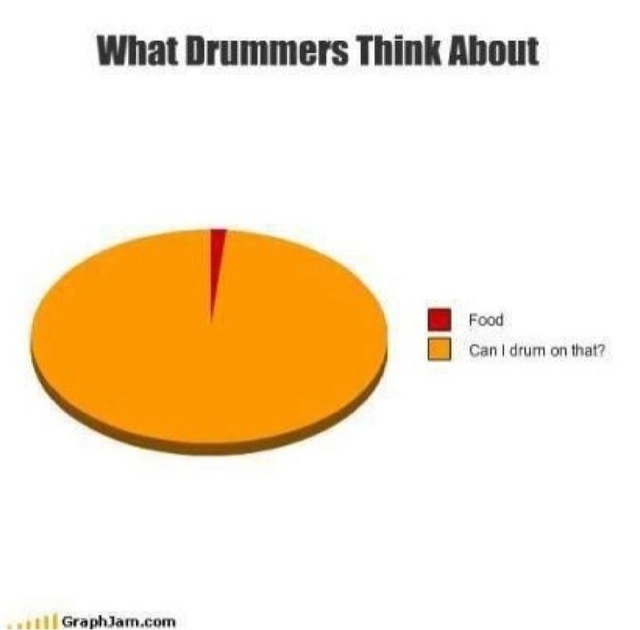 You are an important part of a successful FMB camp! 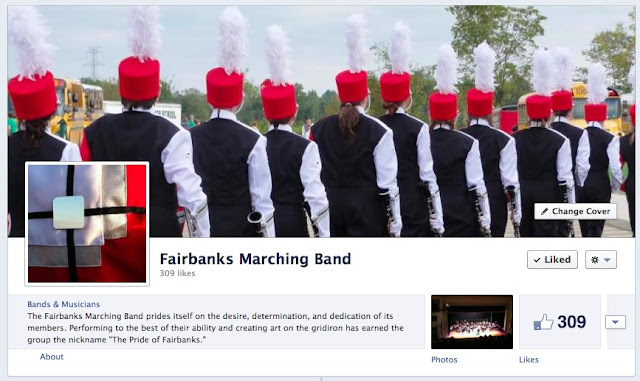 The first performance for the 2012 Fairbanks Marching Band will be at the annual Union County Fair parade on Monday, July 23. The parade starts at 5PM this year, so band members will need to be ready to warm up at 4:15 on the South lawn of the Union County Courthouse. Here's your first weeks of rehearsal! Be sure to come to all rehearsals wearing athletic shoes and socks, and bring your instrument, music, sunscreen, sunglasses, and a big water bottle full of ice cold water. Check-in/Check-out Times/Procedure Camp check in is in the Hayes Hall lobby on Sunday, July 29 from 3-5 PM. See directions below to find your way there. 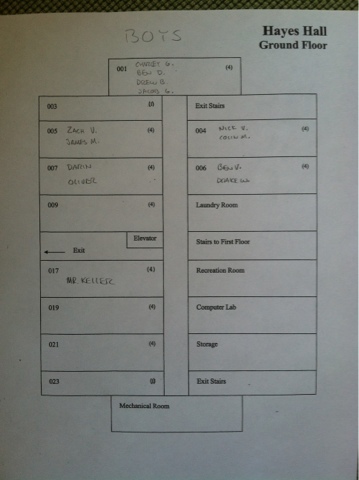 If you get lost, call Mr. Keller's cell at 937-243-2031. You will need to check in to get your key and meal pass. You will need to bring your emergency medical form (see below), any money that you owe, and any money for supplies, etc. Check-out is immediately after the End-Of-Camp Show on Friday, August 3, which will be approximately 6 P.M. If your parents are not coming to this show, please arrange your ride for 6:00.